Have you been affected by reduced library opening hours? While local libraries are reducing their opening hours, Fawdon’s volunteer run library has extended opening times and has recently initiated a mobile service to a local care home. 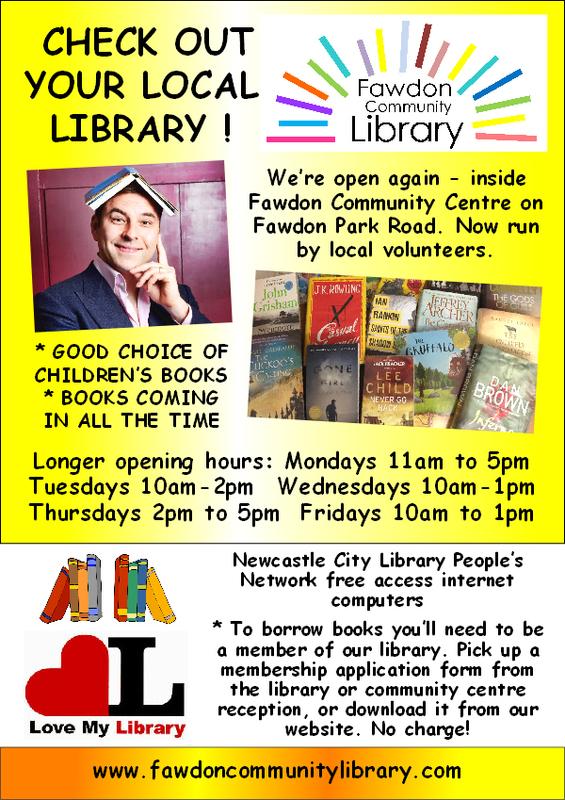 Pop in and see us at Fawdon Community Library – membership is free. You can find us within Fawdon Community Centre on Fawdon Park Road – just 2 minutes away from Fawdon Metro station. If you are affected by reduced opening times at your local library, pop in and see us at Fawdon Community Library – membership is free. You can find us within Fawdon Community Centre on Fawdon Park Road – just 2 minutes away from Fawdon Metro station. We opened for business at the end of May and we’d be delighted to see you – whether to browse or borrow a book, to join up (no charge), to offer your help as a volunteer, or to use the Newcastle City Libraries People’s Network computer – free internet access if you are a Newcastle Libraries Member.